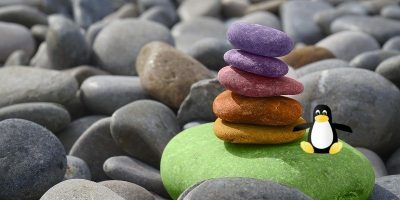 Here at MakeTechEasier, we’ve covered Linux desktop issues of all kinds, and we’ve examined desktop environments both well known (Gnome and KDE) as well as somewhat obscure (Window Maker, LXDE). For some reasons, we’ve never taken a close look at the very popular XFCE desktop environment. It’s nearly as feature-rich as Gnome, but with a smaller footprint. 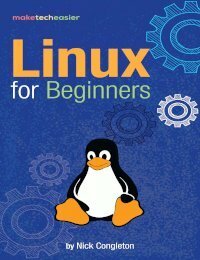 As it’s been a big name in the Linux desktop world for quite a few years now, it seems we’re long overdue to check out this polished and useful collection of software. If your distribution does not have XFCE in repositories, you can fetch the packages or source code manually from here. When finished with your install, log out of your current desktop environment and choose XFCE Session from your login menu. We will be using the current stable release – XFCE 4.6. 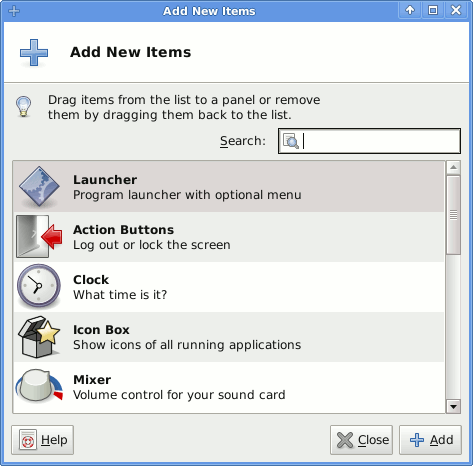 Optional Bonus Pack – Some distributions, Ubuntu included, offer a separate package of extras like panel applets. To install it, check your distro for a package with a name like xfce4-goodies. The example screenshots here are all based on the xfce4 package from Ubuntu’s repositories. If you used a different installation source, your desktop likely looks a bit different. 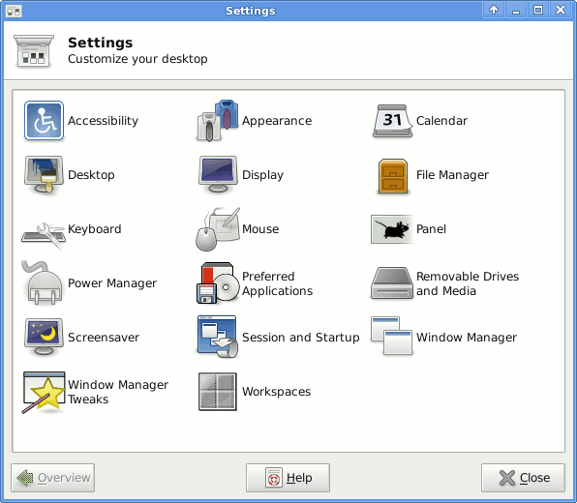 This setup is very similar to what you’d find in a Windows or KDE desktop, with your application menu in the lower left, as part of a panel with a few basic applets. 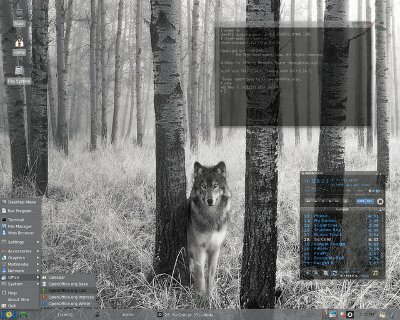 Other XFCE desktops may be set up in a more Mac-like fashion, and many users like to replicate the Gnome look. XFCE is flexible enough to allow any visual approach you’d prefer. 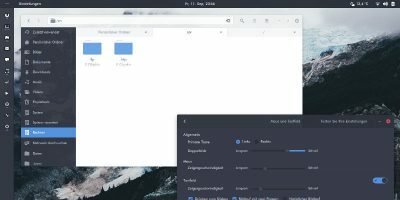 Much like Gnome, you can right-click any blank space on the panel to access its properties or to add new panel applets. If you installed the xfce4-goodies package, you should have a fair amount of applets to choose from. If this is not enough, you have the option of installing xfapplet, which allows you to run gnome-panel applets in XFCE. Each config section is its own module, which can be access individually from from the application menu under Settings. Optionally, you can use the Settings Manager found in the same section. 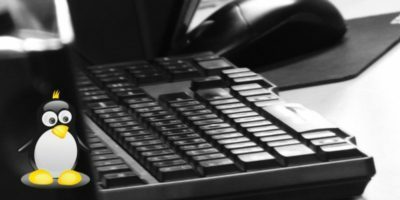 There are a few oddities in the configuration (such as most of the keyboard config being found in the Window Manager module) but overall it’s a fairly comprehensive and useful set of tools. While the basic desktop is nice, users always make things a little more interesting. 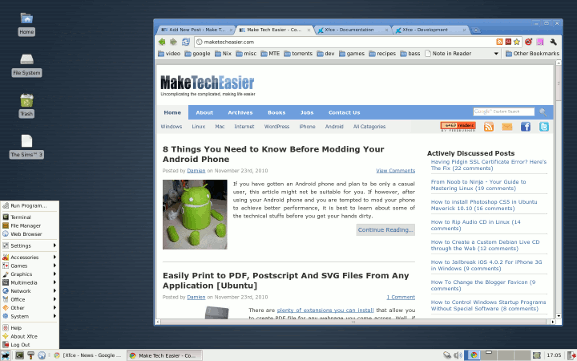 The following are some user-made screenshots to demonstrate some of the flexibility XFCE provides. If you want the benefits of graphics compositing (translucency, hardware rendering) without the bells & whistles of Compiz, XFCE has you covered here as well. To enable the built-in compositing feature, open Window Manager Tweaks from the “Settings Manager” or menu. You’ll find the Compositor tab on the right, where you can enable and configure your graphics settings. XFCE is flexible enough to look any way you wish, fast enough to run on most any machine, and powerful enough to keep you satisfied. It may not have all Gnome’s features, but it’s not supposed to. XFCE promises to be lean and mean, and it’s this author’s opinion that it delivers on both counts. That’s a difficult answer, as it depends on quite a few things. For example, do you mean memory footprint with both Cairo-Dock and AWN running? With or without applets? And compared to which Gnome package? 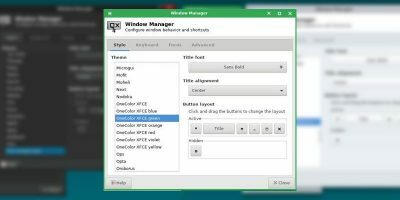 What I can say is that XFCE generally starts fewer background services and “helper applications” by default, and that the applications it does use are often (but not always) slimmer than their Gnome counterparts. Xfce is often criticized as bloated with heavy gnome dependencies by LXDE fans. How true is that? Have you looked at Xfce4.8 pre-release yet? There are apparently big changes coming. 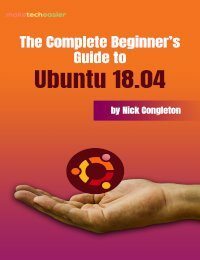 The criticism about Xfce being bloated comes from how Canonical tries to cram so much into Xubuntu that pulls in so many GNOME dependencies that it causes it to be more bloated than Ubuntu, and I’d bet that those same people have likely not bothered to look at other distros that use Xfce as the default desktop. If they did, I don’t think they’d find them to be nearly as bloated as Xubuntu. 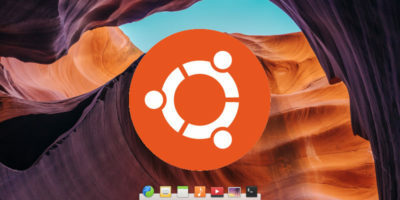 As an Xfce fan, I consider that unfair, and it’s crap like that that was one of several reasons I left Xubuntu for the Xfce version of PCLinuxOS, which is a bit lighter on system resources. I dont know why people keep beating this XFCE is less bloated than GNOME drum! I generally run a lean desktop and turn off all bells and whistles. with a few quick-launch icons. Turn off desktop compositing and shadows. and gnome beats XFCE by a few MB of ram every time for me. They are virtually equal in memory consumption, from what i’ve seen. While not as light as E17 or maybe LXDE or any of the super-lights, XFCE is still quite a bit slimmer than Gnome. I’ve done testing of this myself- how do you explain that a computer with 128 MB of RAM can run Xfce4 comfortably and can’t even load Gnome in the first place? This would mean that Xfce4, will all of its default applications, is lower resource than Gnome. However, a DE is defined by its utilities- without that it would just be a WM with a panel. Thunar, Xfce4’s file manager, opens quickly the first time- every time I try to open Gnome’s, even on a beefy machine, it takes a couple seconds. This could certainly be improved. Also, Thunar brings up icons for files more quickly than does Nautilus. Ristretto is another example. 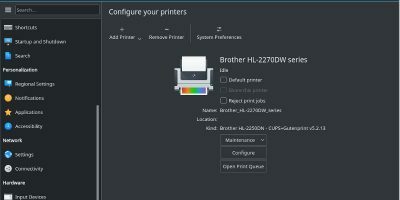 However, even after all of this, people say that these programs lack features that the Gnome counterparts have. Well, tell that to my Grandma. I don’t think she really cares if there’s some obscure option laying around in her file manager. If you have actually tried Xfce4 on a low resource machine, admit it to yourself that it’s faster than Gnome. If you haven’t, stop talking crap on something you don’t know anything about. Being faster doesn’t mean you’re better than the other guy. 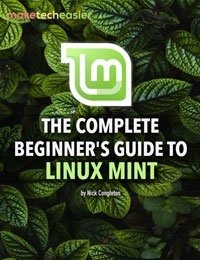 If you can’t afford a computer that can run the heaviest DE in Linux, then you have more problems to solve than arguing about which is lighter. Xubuntu on my system, with Firefox running, uses about 210MB of RAM. I was hoping this would be an opportunity to comment on the preview of 4.8. Looking very much forward to that. Xfce is faster and snappier than Gnome, as long as it’s not on a *buntu/derivative distro. But if you must use *buntu, then LXDE would be a better choice. Banshee: Is It Good Enough To Be The Default Music Player For Ubuntu?